Check out this baby!! 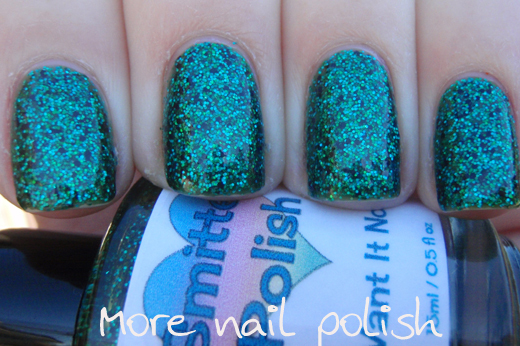 Smitten Polish - I Want It Now, and let me tell you, you're gonna want it now! 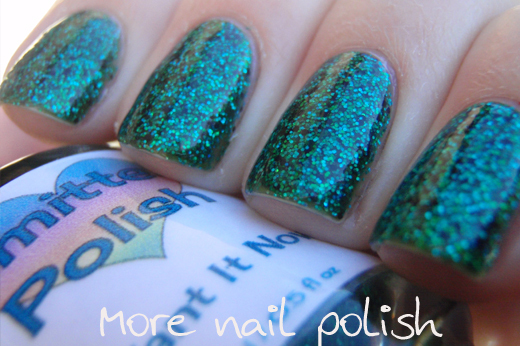 This polish is part of the Smitten Polish Confection Collection at it is in stock right now on Llarowe. This polish is so much better in real life than in photos. It is made up of all fine glitters in a green jelly base. 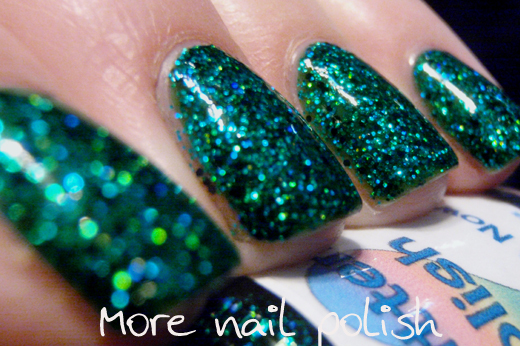 The glitters primarily in green holo and turquoise holo, but it also has a nice serving of black glitter that darkens up the polish. 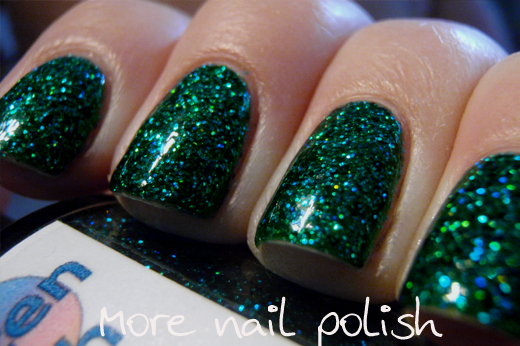 Its like a greener, richer and glitterier (that so it a word!) version of China Glaze Atlantis. Cause it's all fine glitter, it does dry to a gritty finish, and if you want all the glitter to really sparkle you need to get it nice and glassy smooth. I'm wearing a PVA glue base, three coats of I Want It Now, a layer of Ulta3 non-chip and Seche Vite top coat. It applied nicely and wore well, and then peeled off perfectly in the shower when I was ready to remove it for my next mani. 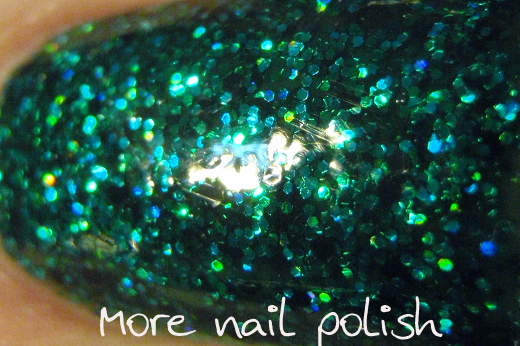 The photos taken in the shade show the polish a little washed out, whereas the photos with artificial light are closer to the real green shade of this polish. PVA glue as your base coat? Is that so the glitter comes off easily? 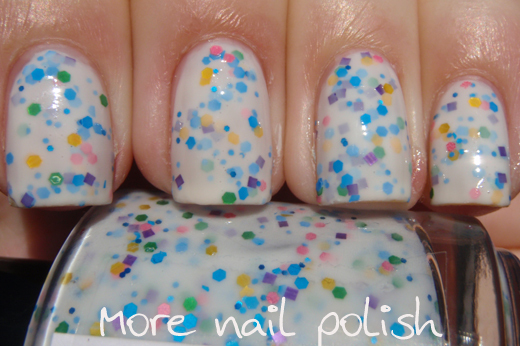 Do you think the mani would last longer than 1 day with a glue base? I'll have to try it. Stacy you must try it. No more foil method required. PVA glue is just like the essence peel off base coat, and it can last at least 5 days as long as your not swimming or taking long soaking baths. 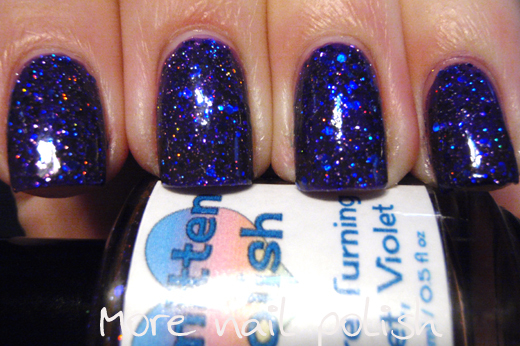 Pretty Purple Polish did a great post about wear and questions. Ohhh, so gorgeous!!! The rest are awesome, too!! Ok I have my first PVA glitter mani on right now. Thanks for the info. Now I'm gonna be in big trouble because I just found at least 4 polishes that I want now! LOL. Leah Ann at Llarowe is gonna be loving you after these polishes because I'm sure these colors will fly off the shelves. I love them all. I need that green in my life! 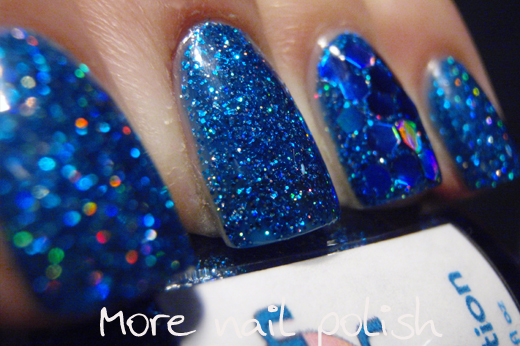 those are so outrageous polishes !!! love your swatches.